You’ve taken the time to save and make an investment in a computer that will work well for your personal or business use. The Apple MacBook, whether it’s the Air, Pro, or Pro Retina, is a marvelous machine. Now that you have doled out all that money for it, don’t get skimpy on purchasing a case to protect it. BestLeather.org has reviewed a couple of other pieces for Eser Dasdemir, owner and “chief artisan” of Tox Leather. Tox Leather is boutique shop located in Istanbul, Turkey that is committed to quality, eco-friendly, hand-made leather goods. Be sure to visit the Tox Leather website. Since publishing our review of their Cigar Cases, it appears that Tox has rolled out a great looking, new website and is offering some new items too. 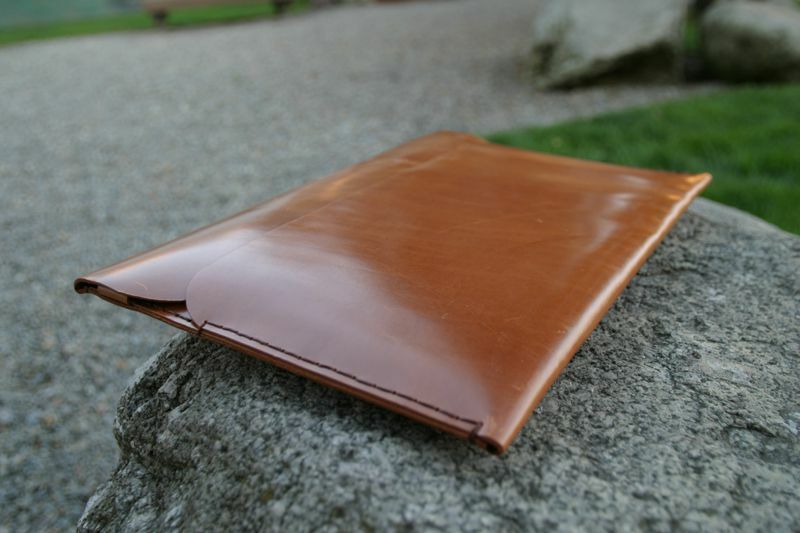 The Tox Leather Shiny MacBook Case is well constructed. As with Eser’s other items, I’m not sure of the origin of the leather, suffice it to say that it’s definitely cow leather. The case features a true to the name “shiny” exterior. This certainly has its perks: you can easily wipe it off if you spill something on it and the case will easily accept a clear polish or protectant. It also appears to scratch easily. The case arrived with a couple of sizable, noticeable scratches on the front of it. However, this does not detract from the looks of the case. It just adds to the sought after patina that most leather aficionados desire. 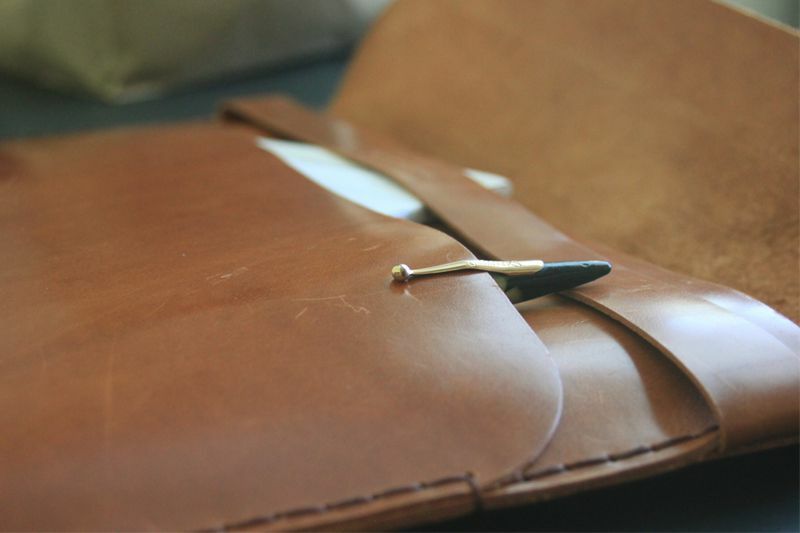 The edges of the case are cut precisely and the hand stitching has been executed perfectly. The use of a slightly darker color, heavy gauge thread adds to the already attractive, professional look of the case. The Tox Leather Shiny MacBook Case performs it duties well. It’s especially nice if you’re off to a quick meeting and only need your computer and a notepad. You can quickly load up your laptop and off you go, feeling confident that your precious Apple product is protected and enmeshed in a stylish case. It’s small enough in size that it can easily be tucked into a backpack or larger messenger bag. I say “larger” messenger bag because it’s too big for my Swiss Army Packsaddle Bag. However, I don’t see that as a drawback – my bag protects my laptop on its own. I rather see the Tox Case as a means to protect my laptop when I don’t need to carry other items with me. The flap can be secured two ways: you can slip it under the strap or you can slide the flap into the external pocket. Either way, loading and unloading your laptop and papers is a breeze. As mentioned earlier, the Tox Leather MacBook Air Case is an attractive, professional looking case. It gets noticed too. Having carried this to a couple of local meetings with clients, I’ve experienced several positive remarks and questions about the case. The color of the leather is great too. If you want, Eser makes the same case in a deep black leather too. Just look on the site and you’ll see it listed separately. The Tox Leather Shiny MacBook / Document Case I have is sized for a 13” MacBook Air. If you’ve shopped around for other cases on the Internet, you’ll know that for $85, this handmade leather case is a bargain. And, it pulls double duty acting as a document case too. So, avoid the factory produced nylon and plastic cases that the masses use and get yourself something that is crafted with care, will protect your expensive laptop, and last for years – go visit the Tox Leather website. 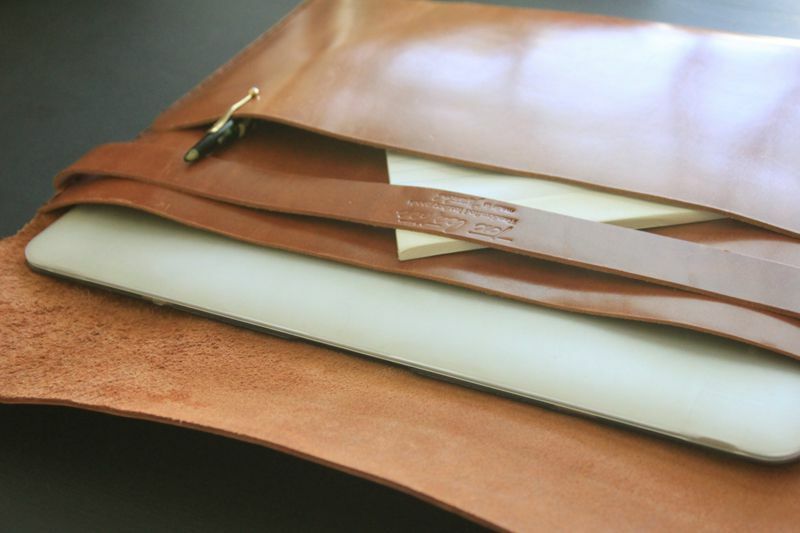 2 Comments on "Tox Leather Shiny MacBook / Document Case Review – $75 to $95"